A product of the now-defunct draft-and-follow process (he was a 22nd-round pick in the 2005 draft), Hanson garnered plenty of headlines during his ascent to Atlanta. The 6-6 righty laid waste to AAA to start the 2009 season (66.1 IP, 12.21 K/9, 2.31 BB/9), and he has made a very strong first impression as the Braves look to stay in the playoff race. Hanson has punched out 6.72 per nine frames in the majors, with 3.54 BB/9 and a 4.14 FIP in 73.2 IP. The soon-to-be 23 year-old has all the pitches: a 93 MPH fastball, 83 MPH slider, 75 MPH curve and an 83 MPH change of pace. Hanson is getting ahead of hitters pretty well (his 63.4 First-Pitch Strike% is over 4 percentage points above the MLB average), and his breaking pitches in particular look nasty. The 23 year-old Venezuelan (formerly of Arizona and Oakland) seems to have garnered the “busted prospect” label, based largely upon his anemic work with the A’s in 2008 (.278 wOBA in 316 PA, with an untenable 4.1 BB% and 26.8 K%). It’s never wise to write off such a young player, however; it’s not as though his skill set will just automatically remain stagnant. Shipped to Colorado in the off-season, Gonzalez pasted the Pacific Coast League for a .339/.418/.630 line in 223 PA in ’09. AAA Colorado Springs is certainly a favorable offensive environment (inflating offensive production by nine percent compared to a neutral ball park from 2006-2008), but CarGo did a better job of working the count with a 10.3% walk rate, whiffing 16.7% of the time. Gonzalez is getting fairly regular playing time for the Rockies right now, and he has a .285/.341/.517 triple-slash in 170 PA. Coors caveats apply, but Carlos still has +3.5 Park-Adjusted Batting Runs on the season. He hasn’t transformed into some model of plate discipline (31.8 Outside-Swing%, 25% MLB average), but Gonzalez has taken ball four 8.5% of the time. He has also chipped in 8 steals in 9 attempts. In 2009, Fukudome has boosted his lumber production with a .369 wOBA. He’s drawing a walk 16% of the time, with a .191 ISO to boot. Kosuke has compiled 3 Wins Above Replacement already. He basically looks like the scouting reports suggested: great eye, doubles power with the occasional dinger, with a enough range to play a passable center field. When the Rangers acquired a bounty of young talent from the Braves in the July 2007 Mark Teixeira blockbuster, Feliz was a hard-throwing string bean with less than 75 professional innings under his belt. Two years later, Feliz is just plain overmatching major league batters out of the ‘pen. His repertoire in short stints has been sick: a 98 MPH fastball, an 81 MPH power curve and an 89 MPH changeup. 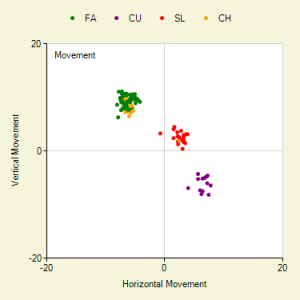 A lot of guys throw hard, but few possess Feliz’s combination of velocity and movement: his fastball tails in on the hands of righty batters 7.4 inches (6 inch MLB avg), with 11.2 inches of horizontal break (8.6 avg.) He essentially throws his heater with 4-seam velocity and vertical movement, with the running action of a two-seamer. In 8.2 IP, Neftali has whiffed 16 batters, without allowing a walk. His long-term future lies in the rotation, but he could conjure up memories of K-Rod’s 2002 dominance in the meantime. The former Rays slugger is anathema to all things leather (career -19.9 UZR/150 in the outfield), but the born DH has slammed NL pitching for 15 home runs and a .277/.357/.584 line in 196 plate appearances for the Reds. Gomes likely won’t continue to homer at a Pujols-like pace, but even a performance in line with his career .240/.332/.470 triple-slash would be of use to fantasy owners. He can slug with the best of them, and he’s in a ballpark that certainly digs the long ball. Mets fans must be balled up in the fetal position by this point, no? The club entered the season with a strong shot of competing in the NL East on the basis of the Santana/Reyes/Wright/Beltran quartet of stars. Only Santana remains on the field now, as Wright took a 94 MPH Matt Cain fastball off the helmet in Saturday’s contest against the Giants. The third baseman was having a productive, if atypical season at the plate in 2009. His .387 wOBA doesn’t look all the different, but Wright’s ISO dipped from around .220 from 2004-2008 to just .143 in 2009. He punched out a career-high 24.6% of the time, yet hit .324 on the basis of a ridiculous .415 BABIP. The focus now, though, shifts to Wright’s long-term health. There’s a better chance of sudden peace in the Middle East than the Mets making the playoffs (Baseball Prospectus has New York’s odds at 0.15%; “so you’re telling me there’s a chance…Yeah!”) Wright didn’t “get his bell rung”, and he wasn’t “shook up”. He suffered a brain injury. There’s no incentive for the team to rush him back. Cueto has gotten throttled since the calendar turned to July. The 23 year-old Dominican gave up a .587 opponent slugging percentage that month, has been battered to the tune of a .644 SLG% in August. He cramped up during his August 11th start vs. St. Louis after two innings, then got drubbed for 8 H and 7 R in just 2.2 IP against the Nationals on the 15th. Johnny has made some progress in terms of limiting free passes (3.03 BB/9, compared to 3.52 in ’08), but the homer problems persist. Cueto’s HR/FB% isn’t out of whack (11.2%), but the flyball-slanted righty has allowed 1.32 HR/9 this season after serving up 1.5 per nine in 2008. Reds skipper Dusty Baker has indicated that Cueto will have his next start skipped. Not that long ago, I asked if Zimmermann might just be the best of 2009’s crop of rookie starters. Unfortunately, that argument is now moot. The 23 year-old righty will be out anywhere from 12-18 months following Tommy John surgery. It’s a highly disappointing development for Nationals fans, who had visions of a Strasburg/Zimmermann 1-2 duo leading the club out of the depths of the NL East standings. A 28 year-old minor league vet with a career .265/.321/.463 line in nearly 2,500 PA at the AAA level, Jones went all Shane Spencer on the NL in July (1.061 OPS, 10 HR). August has seen Mr. Jones hit a more reasonable .259/.333/.444, and even that is above what one would expect based on the big lefty batter’s minor league numbers. Per Minor League Splits, Jones’ work at AAA Indianapolis to begin to 2009 season translated to a .259/.291/.408 line at the highest level. His 2006-2008 translations are similarly bleak. Performances at the extremes tend to skew the perception of a player. Jones’ incredible start likely had some running to the waiver wire to claim him, but his much larger body of work suggests that he’s more major league filler than some breakout performer. Milledge has a clean slate in Pittsburgh, getting another opportunity to make good on the promise that made him a top prospect in the Mets system and a sought-after trade target of the Nationals. Thus far, it’s not working out very well. The 24 year-old has expanded his zone in the majors, walking just 6.6% of the time and swinging at nearly 32% of pitches off the plate), and he is hitting just .213/.259/.250 in 86 PA in 2009. Lastings’ walk rate under five percent. He’ll continue to get regular AB’s with the Pirates as they seek to rehabilitate his deteriorated plate approach, but it would be nice to see some sort of progress here. We hoped you liked reading Stock Watch: 8/17 by David Golebiewski! I’m thinking about dropping both Garrett Jones and Andrew McCutchen and adding two of the guys mentioned above, and/or Rajai Davis. Amazingly all of them except Hansen are available in my league right now. I can’t see any reason to keep McCutchen (not a keeper league) over the group mentioned above, except for his nice home split. He’s at home this week, so I might wait until the Pirates’ off day on Thursday to dump him and Jones.